Girlfriends having a lively conversation. But there's always time for a quick shoulder check. Love the hand-painted hearts on the chainguard. You should concentrate while driving not to look back around especially on the street with many vehicles. 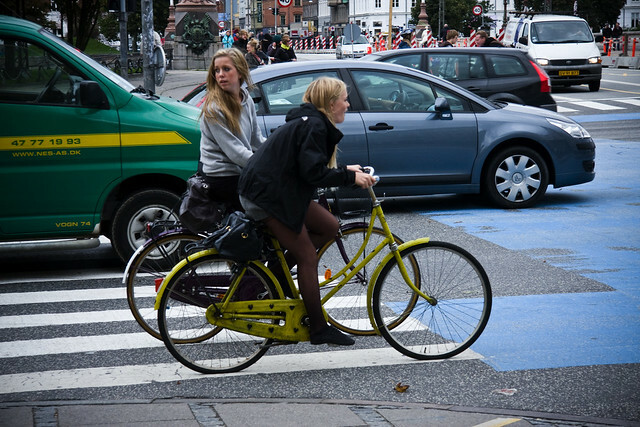 shoulder checking is an important of urban cycling and driving. you're taught this from a very young age in Denmark. Oh, and everywhere else. Mikael, you are correct about shoulder check. I do so like the expression on the young lady closest to you. That would be one shoulder to head shot without bicycle I would like to see head-on. Might you have gotten it?